"My father was a very famous actor, as you know, and as the story tells in the restaurant's photos, with friends such as Alberto Sordi, yet he always loved cooking more and cooked on the movie sets for the actors. He said one day that he wanted to present the guests of his with the creativeness in the kitchen and turned to a full time chef. For 35 years he has had involvedment in Rome, where he is a native, and the last years here a total of 14. He passed away last year and I want to carry on his tradition of love of the Roman culture which he shows truly in his 100% Roman traditional products, traditional wine and traditional recipes that have remained the same on the menu the last 10 years at restaurant," says his daughter, Floriana, the very accomplished artist and my friend. My father too passed away the last years and I know how difficult it is to deal with life on a daily basis without the kinship and friendship of my best friend. 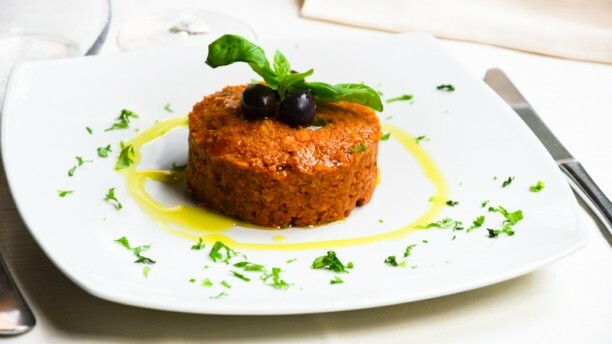 "My father went each day shopping and addressing his trusted suppliers and vendors to help him to chose the best ingredients to present the very simple Roman food. Rome, traditionally was food for the common folk as the nobility when to the countryside to their castles and it is VERY IMPORTANT TO SAY, THAT ROMAN FOOD WAS A POOR MAN'S FOOD," Floriana says. "The wine,however, is from a nobil family that has had their castle many centuries on the outskirts of Rome!" "You must try three things to eat and drink, first the Paccheri Carbonara with fresh homemade pasta the omelette the Roman style which is without eggs, and of course the Nobility Wine of the Roman Castles and the Vannelli family, which we have gotten our wine in barrels from the last 30 to 35 years. The wine only comes in the barrels and it is the only wine you can have here in little carafes. 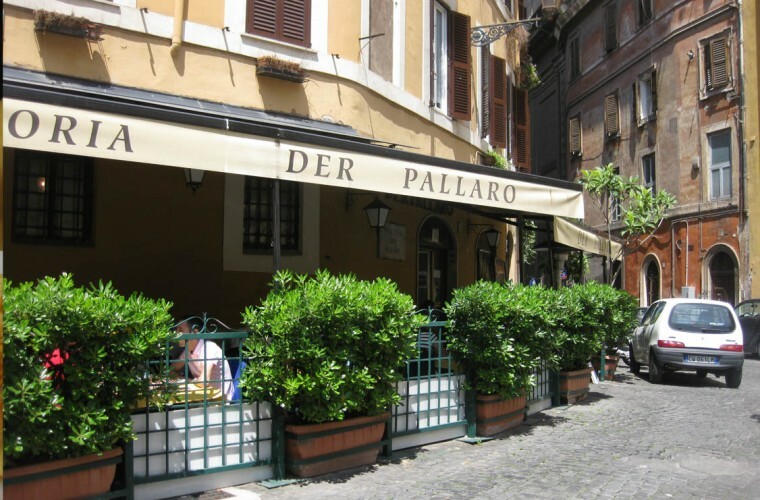 It is a very simple restaurant and it is typical of the representation of the real Roman food. The food is simple and the wine is simple. You come to have a comfortable lunch and a family dinner with me now, " says Floriana, the gorgeous artist who finally has one of her series of art on the walls named, Garden of Eden. "My art started at the age of 4, I am telling you now. I have worked with my father in creating that work of art and he gave me the gallery to show the art. That is how it started." "It is very rare that you shall find a Osteria that has 7 socials for such a long length such as we do. The two families, me and my brother, Guido, and my wife Silva and the other family of brothers and sisters and wives, have been friends and partners about 41 years now. That is a very rare find," says Renato who says I can call him Rene if Renato is too difficult! Along with the meat and cheese plates you can create, they have fresh homemade pasta dishes with a couple of different touches such as Pheasant pate with truffles, Venus black rice and mussels, Guinea fowl and wheat, Tagliatelle with hare ragu...some very special treats! 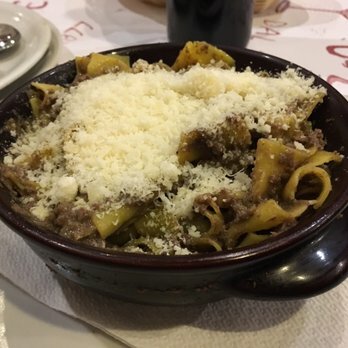 "Over the years, since we became very respected of the locals of Rome and since we became quite frequented by tourists who started to find us, we added a restaurant in house and kitchen adjoining to make hot dishes instead of just meat and cheese and wine platters," says Renato. As we chat near the windows, the waiters, all young neighborhood guys, rush back and forth laughing at us as they bring food and wine to tables. "The young ones help us out now. In the last years, it used to be all of us cooking and making the food and all of us are sommeliers of the wine, yet now it has gotten so big that we need a little bit of help." 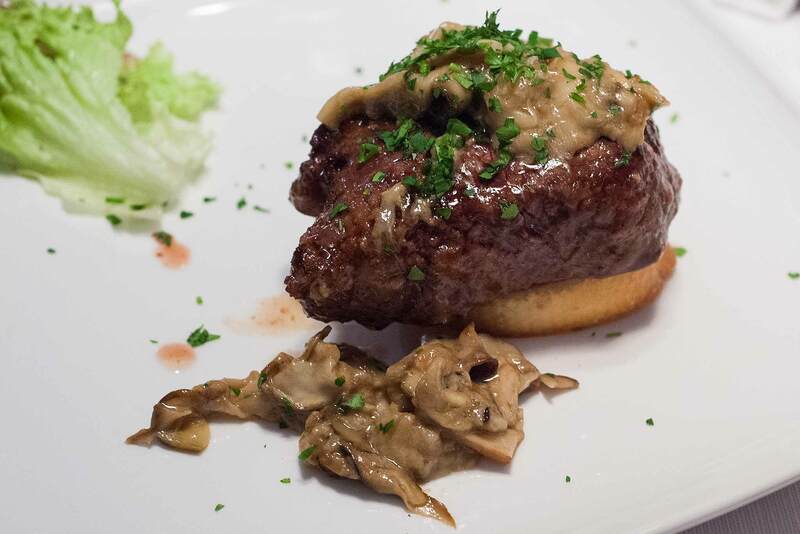 "When we add and decide the menu about 3 times per year, we all talk about it. Maybe I say that I could add that dish, etc. It is literally impossible for each of us 7 to have a pasta dish, a meat dish, a fish dish, yet we try the best!" 40 plus cheeses and 25 specialty meat platters! plus make my own platter! "The specialty graduated from meats and cheese platters, of which we have many high quality selections from farmers, to each of our 7 member social's recipes, such as my brother's duck raviolis, or my onion soup, and just so you know every pasta is made homemade. Every day. What else makes us different? Well, we have collected, and I tried until a couple of years ago, to drink every wine that we carry which today is about 1,000 plus labels in the restaurant," says Renato. 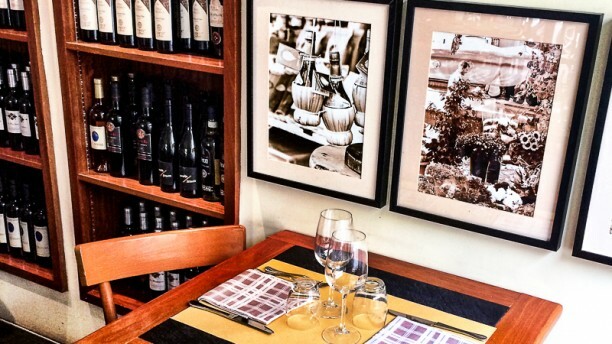 What shall you find at Enoteca Cul de Sac? Warmth, both in person and comfort, and traditional marble bar with heavy wooden furnishings and a great outdoor terrace. Great wine 1,000 plus bottles. Homemade pasta, wild game dishes, and about 41 cheese and meats platters to create ! "Sometime a little different that we have at the Osteria, since many people come, yet we want it to be informal, is the Que time. We have reservations only in the sense you can tell us what time you want to Que in line! 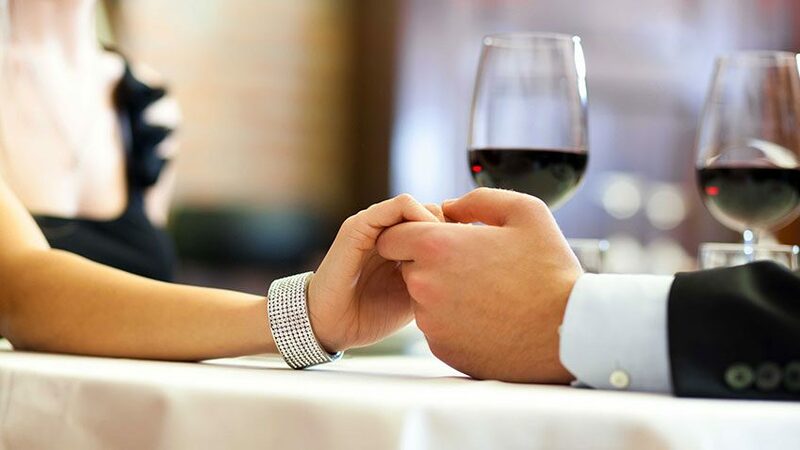 That way if you come at 8:00pm and there is a full room, have a glass of wine, stand outside and talk and as soon as we find a table we sit you. Yet at least you can be first in the que at 8:00pm!" hmm...me thinks it is very busy here! Federico, the very suave latin owner of La Tavernetta 48 is a sweetheart. The nicest and most honest person, totally loving his guests, his restaurant and his team 100%. I have known Federico and for that matter his very funny assistant, Allessandro, the last 4 years and written about the restaurant twice already. The fact is it started with Federico at the helm as a cute restaurant that had lovely food with modern presentations, yet has graduated from cute to very elegant and romantic. A VERY MUST find while in Rome. 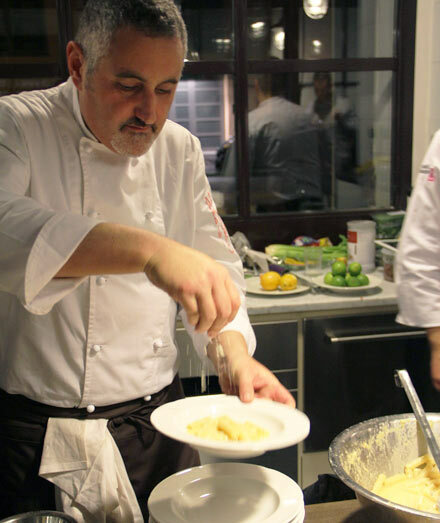 And while the presentations are creative everyday since the chef has a fish special that changes daily, they have very traditional recipes of Roman and Italian cuisine. I just love the team and the capo. They are ALWAYS LAUGHING, ALWAYS. "The chefs that I had is when you first came, Allesandro's father, yet I wanted a new fresh creation on the lunch menu everyday. That needed a new chef, and hence another Allesandro. Now the last 1 year and 5 months, Ahmed has been my head chef and I really enjoy working with him. He knows my vision yet he has a creative mind of his own and everyday he does a new menu for lunch of 3 course with 1/4 wine, water, dessert for only 15euros. Of course at dinner it is a little more," laughs Federico. ps i am coming to lunch. 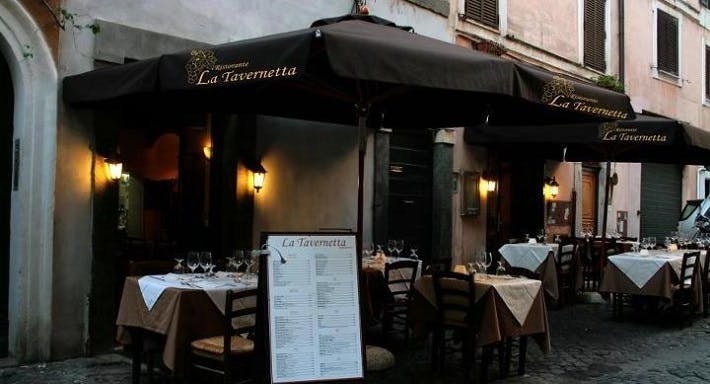 The restaurant, La Tavernetta 48, is a jewel. Full every night and although freezing in the winter months, the people are very willing to sit outside with the heat lamps if they must. The reason is a couple, really. Federico, the Capo is as kind and friendly as you shall ever find, his right hand person, Allesandro the funniest and friendliest, and the rest of the team super nice. The food is the best with such a elegant understated formality that you are at once elevated to sophistication and at ease as if with family. The laughter and conversation always VERY lively! Okay, you say what happened at lunch? Well, I came, sat in a tiny two person seat, waiting for my friend Alberto. About 5 minutes into the service, Allesandro turns my table and a table of 5 come. Lively family, yet they wait. Another 12 minutes and they are joined by the father of the table's mom and dad. Okay. Now my mussles come. Um Yum. They are the most scrumptious and I eat these very slowly since they make me full. Wine comes, a priest from the Vatican and another very charming fellow that reminds me of Luca Brasi sit at adjoining tables, together yet separate. About 5 minutes later, the Grandfather at my table aside asks if I would love to share the wine they have on their table. I laugh a little since my wine jar is empty(I love wine and already drank my little decanter! ), yet the table grabs my wine glass and FILLS IT FULL! O o..okay, thankyou very much, and I drink the white wine, the house wine, which is some of the best cheap wine I have ever had. Now, the table orders the mussles with linguine, which I had had, and they order 6 of the same for each of the 6 family members! Hmm...now comes my second course which is Sea Bass and fresh vegatables in season. I must tell you, that I LOVE Sea Bass, having discovered it while at Italy a couple of years now. I had always loved swordfish from Key West, yet I ate Sea Bass and now that is my favorite. As I am eating my Sea Bass, the table of 6 receive their second course, which is of course? :that is right, Sea Bass...6 of these. Well, at least we have the same taste. Soon, Luca Brasi approaches my table and invites me kindly to sit with him. WOW! an honor invitation from Ancona, Italy. I jump up, grab my coat and run to his table where I am happily entertained from a very kind person about Italy. Now, I must go. I accept his invitation to visit Ancona some day and wave. I kiss Federico who now is my friend from the last almost 5 years and ciao ciao to my team. 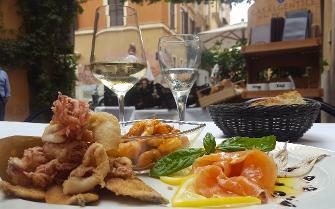 A lovely lunch in the eternal city of Rome where I have ventured 8 years. You feel so much when you are surrounded by the beauty of the Vatican, the ethereal spirits, the Collsseum and the Ghosts of the Gladiators and Christians, the gorgeous countryside of Tuscany and Rome, the Private Tours of Italy that you create with a phone call to Joseph, the young Capo of What a Life Tours and his very qualified team. Or perhaps you would want to do a Collsseum Night Tour with special access to VIPsections, Named Coliseum under the Moon Tour, you are allowed inside the Collsseum Underground and Arena Floor while the Colosseum is closed to the Public. If you are superstitious and believe in Ghosts of Gladiators and Lions, maybe bringing a friend and a phone in case you have a close encounter might be a good idea! "Have you ever taken a good look at the Laocoön and his Sons?" or been a statue yourself! Says Joseph, "The marble sculpture, displayed proudly in the Vatican Museums, is amongst the most admired and influential pieces in all of Western art. For centuries, it lay buried in a Roman vineyard until unearthed by chance in 1506. Michelangelo praised the sculpture as a "miracle of art" and it was hailed as the classicist ideal of "noble simplicity and quiet grandeur”. The Laocoön became the quintessence of ancient art and, to this day, the scene of the Trojan priest and his sons, desperately struggling for their lives, is a theme frequently parroted by artists. " I met Joseph's marketing director, Peter, who is a American married to "a Italian girl and we spent the last 17 years here. Soon we move back to America where my very Italian wife will be able to experience America. I shall miss having the Forum in my backyard, of course!" True, you have so much to wonder about in Rome and so many places to wander to! You can also take a day trip to Pompei and the Amalfi Coast of Rome, or a private Tivoli day tour from Rome with Villa d'Este and Hadrian's Villa if you choose to do that. And if you plan on traveling from Rome to Florence, Italy, they can provide you with transportation and plan the Ufizzi Gallery tour in Florence along with great wine country along the way. Just ask! When you enter the Collsseum if you are in tune to the air around you most people say they feel something. They shudder, they feel the people who lost their lives here, the feeling of something...difficult to explain; afterall, you are in the eternal city where strange things happen. The tours of What a Life's Collsseum Tours are with the best guides who make it fun. You could be very dreary and depressed underground where they held the prisoners til they entered the arena floor, where if you take a private tour you can actually step foot on that sacred arena ground, yet the guides make it fun. Mine made us all be lions and archeologists and we started laughing and joking. Yet you do feel the people there before you if you take a private silent moment and imagine. Claudio, who looks identical to Christopher Walken, says as he shows me the cool Vespa museum in the downstairs of the biggest Bici Baci location in Rome, at Via Cavour, 302, I have a passion for Vespas! And as we see the cool Vespas from the original purchases that Claudio has done over the years, such as the 1,000,000th Vespa ever made in 1950, to the present, including the very original one from the movie ROMAN HOLIDAY, YOU understand that he definitely is telling the truth when he says he loves Vespas! 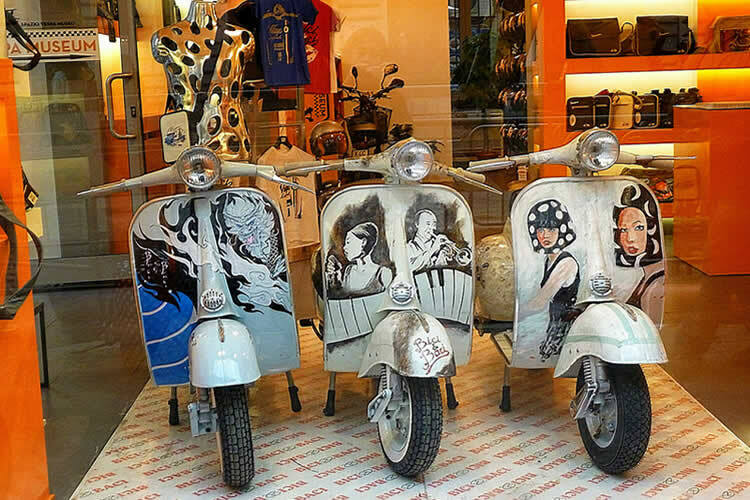 And if you've always wanted to see Rome on a Vespa the way that Roman Holiday Audrey Hepburn and Gregory Peck do, hop on a Vespa of your own or ask one of the many guides to drive you around the city! "A young Indonesian man of about 25 took his Vespa, with the seal from the President of Indonesia and traveled 1 year and 3 months from Indonesia, through Thailand through India, through Turkey through Pakistan and eastern Europe to arrive at my store with his Vespa. Here it is." says Claudio happily as he shows me the photos and the original stickers the young man collected on his journey! Cool. Roberto, who is Claudio's trusted director, shows me the map of the locations of Bici&Baci as a group of Americans rush in to rent bikes. He whispers laughing to me, "They ask worried if we can accomodate a very big group for 25 people! Ha! 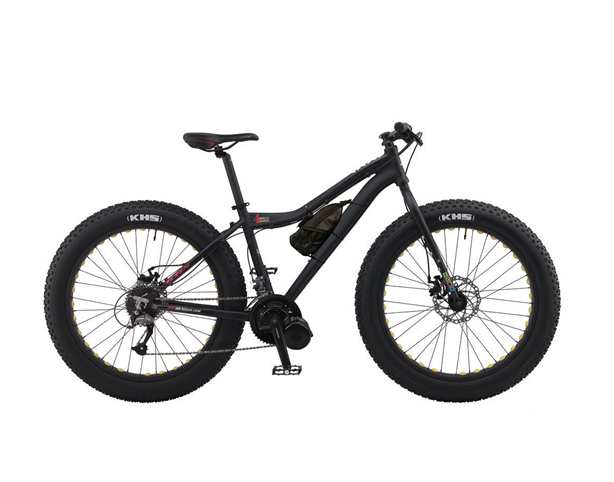 That is easy since we usually have a couple of biking tours that have up to 100 and 200 every day! 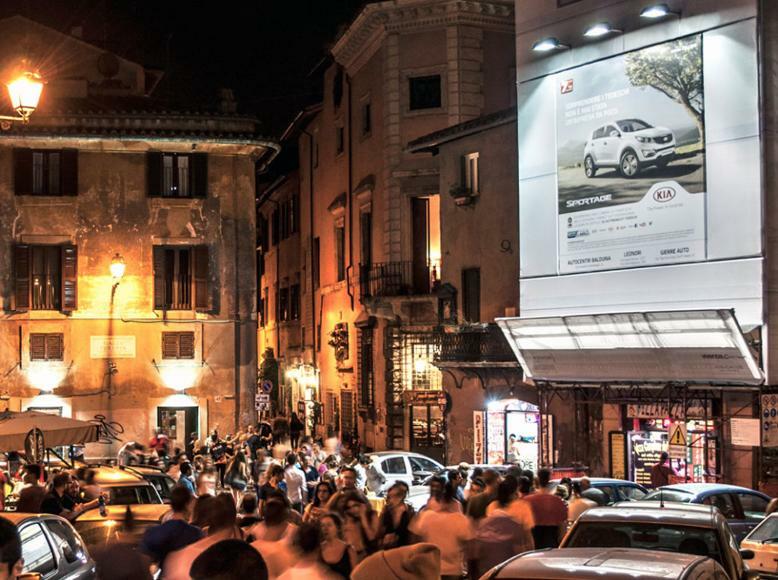 We are very known in the city of Rome and people love us. And we are always crazy in here." And Claudio laughs, as when he showed me his daughter and her friends in the Vespa Museum downstairs doing a video of a nightclub dance party in the museum, "You have to be crazy to come to us or we don't want you. We're all crazy. Crazy with passion." he says and I say, "Crazy with love." Met Andrea today, the other partner of Simone who I interviewed a couple of years since, and he is just as nice as Simone! "I started the restaurant 9 years now and it's concept has always been to use the local producers of Lazio and the best products of Italy. In addition to the wine, which is selected on the same theory as the Slow Food concept. I am the person who usually chooses the wine, yet my team and Simone's team and Antonello's team, since the 3 of us own the restaurant, all go to visit the vineyards and to learn about the wine. I believe that it is important for everybody to know the product and that way we can educate the guests better. Plus it is fun for all of us to have a day at the vineyards trying the wines and getting to know each other. Sometimes they bring about 10 wines here and we all try these to. I believe that some of the best wine that we have is not necessarily the most expensive. The vineyards that we choose have the specialty of using only their own grape in the wine. One grape can make the best wine, you don't need to buy grapes from other people." he says. Osteria Grappolo D'Oro in Campo Fiore 4 years for Slow Food Award Best of Italy. We laughed as Andrea is explaining how fun it is at times to own the restaurant such as the choosing of the wine! "The house wine is especially one of the best around and is only 7.00 euros a bottle. 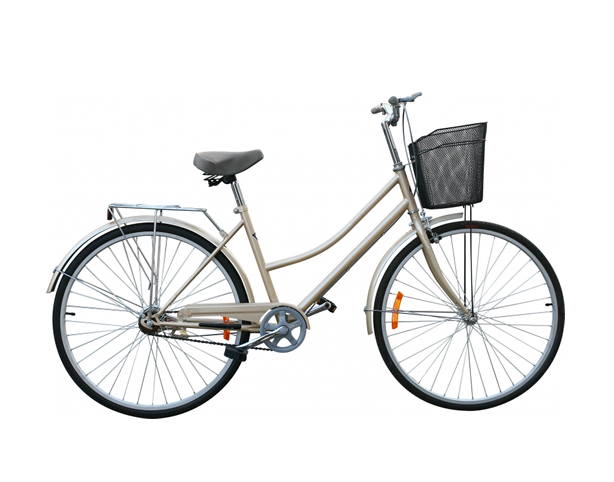 Yes we have much more expensive ones, yet that one is one of the best." he says. "You know it is always difficult when you start a new project. People have to know about you and tell each other how good of a experience it is and the reputation becomes good. That is how you build a great restaurant. Yes, it helps that people find us on the websites; however, it is most important the service and the food and wine that we serve once they come here. We have great food. From the bread that we hand bake with only local and pure ingredients to the pasta our cook hand makes fresh everyday. People love our food. When the original owner of the Slow Food came 4 years since, he wrote about us and added us to his guide two months later as it is published. Then my director at the restaurant calls me and tells me that there is a line of 100 people outside the restaurant and asks if I forgot a group for that day! I couldn't remember any group. Then she said they said they all saw the restaurant in the published editon of Slow Food! So, I totally believe in that publication!" he says. Me? I love to eat the food at the Osteria! It is a beautifully elegant restaurant, with the Maestro, Allessandro ready to serve you his mother's kitchen at the door. He takes your coat and greets you warmly, yet professionally. Two tables are in the foyer surrounded by the wine stunningly displayed. Allessandro is a Juxtaposition of professionalism and playfulness. As I read his wine and champagne labels, I ask if he has the rapper Jay Z and Beyonce's label. We google on the internet and see it is one he doens't carry yet. "Maybe I shall, although it is a special label, Ace of Spades, that he has at around 900.00 euros I see here on the internet!" You know, playful in that respect that you can talk to him as a normal person. And as you enter the huge stately mansion with his precious restored rooms and the historic wine cellars, which are some of the most breathtaking rooms I have ever seen. AS I eat in the beautiful 14th century dining room, the first time I have ever eaten here, I am surrounded with funny waiters that are either on their best behaviour or are always very fun and friendly to the guests. Considering that it is a Michelin restaurant since 2010 every year til 2018, I am guessing that they are always that attentive! The food, lovely. I had a great pasta red sauce with octopus and it is delightful. In addition, some of the best wine that I have ever tasted in my life, the family is famous for their wine list and champagne, and some cute yet very fattening brownie and cookie desserts! Most of all I had a ball! Loved it. Dining in a 4story palace ballroom is rare, at least for me! The cool great ancient cellar of the Casa Bleve where the wine is kept, is "quite cold and smells musty since it is very ancient so we don't do dinner in the cellar; however, sometimes we open a great bottle of wine for the guests to start the dinner and they enjoy it a couple of minutes here." Allessandro says. "I am very happy to have the refrigerated glass case in the front of Casa Bleve, since it allows us to show all of the wine and champagne. We try to be professional here," he says as he takes the coats of the lunch guests graciously. They are all nicely dressed and he says, "Yes during lunch they come from the professional offices and occaisionally we have tourists, yet they mostly come at night. Families are welcome, after all we are one big family here, yet I tell them when they come and ask if they can bring 5 young children that want to eat french fries and pizza that we don't have pizza here. We can do all kinds of pasta or dishes to help you with children and it is alright if they want to play and run around the elegant restaurant. We love children. But Casa Bleve isn't a pizzeria. It is a elegant lovely restaurant with my mother's recipes in the kitchen. We can try to do any kind of pasta dish you ask for to help the children be happy." "With glossy cared for floors, white elegant linens, fresh flowers artfully arranged daily by the cousin Gino Bleve, and the kitchen expertise of Tina Bleve, it is a must when in Rome! "I don't know why we are in the Michelin Guide,"says the VERY funny Allessandro. "You know I think they must have 2 categories of Michelin, for the very important restaurants and for us!" he says and although he seems serious as I see his restauarant, food and clients I think um I believe that I know why. I say that it is very elegant and it must definitely be up to Michelin standards since it has been on there 4 years. "Yes, except we don't have degustation menus, we change the menu a couple times per year and my mother does specials sometimes everyday, yet it is a family restaurant. Elegant, yes, a little expensive in the sense lunch is about 30.00 to 40.00 euros per person simply because the parliament and guests must go back to work at lunch, and at night maybe 60.00 to 70.00 euros since they can drink more wine and champagne." Casa Bleve is one of my favorite restaurants simply for 3 reasons, the beauty of the majestic building, the Bleve family and the food! These are lovely reasons to visit and try some of the Chef, Tina Bleve's dishes, to sample some of Gino's flowers he does fresh everyday on the tables, and the grace and service to be greeted by Allessandro, Tina's son. The restaurant is located at:"O! I want that!" I say always when I see food coming from the kitchen and yes it is a real plate that you see here. He is a funny guy! Nice and very family oriented. "My brother is Antonio," says Allessandro, Gino's brother is Antonio, and my mother is Tina, the chef. We used to have before 5 years the Osteria which is more the family Trattoria and we had a great reputation and since moving to the huge beautiful space we have been in Michelin." he says. And yes the stars love it, as Allessandro is shown here with one of my favorites, the hugely talented Roberto Benigni! The Bleve family bought the building in 2000 and it took 3 years of excavating the underground tunnels to find a Roman Empire treasure, which they immediately told the City of Rome about, and since the Casa Bleve is already a Historical site, they started turning the space below into the gorgeous wine cellars that it is today. If you would love to visit the underground mysteries of the Roman Empire in the 14th century Palace, dine, ask and visit! The lovely charming ring of the family that owns Casa Mia in Trastevere, a 3 star elegant hotel and wine bar restaurant with the happiest Cuoco aka Chef that makes fresh gnocchis in front of the wine bar entrance every Thursday night. Donatella, Luciano's wife, pictured sitting with Fabio standing, tells me her favorite food on the menu? "EVERYTHING. I LOVE IT ALL. ESPECIALLY THE CARBONARA!" Diego laughs and I tell him that I am happy he remembered me from 3 years since and I am happy that his English as improved since before Diego only spoke Italian. Now he says, "Hi" in English and makes a quaint little plate of my favorite food in the world, gnocchis, to try! http://www.casamiaintrastevere.com/ "I find it fun, I guess we do, right?" answers Fabio as he asks his uncle Luciano the same question. "Yes it is fun. We have a lot of fun with the guests in the hotel and the guests in the restaurant. Sometimes it is known for a restaurant that is a quiet place to come for a romantic dinner, especially the garden. Of course on Friday and Saturday it isn't so quiet. Okay and on Sunday." says Luciano and me and Fabio start laughing and say, "and on Monday and Tuesday and o yes maybe on Wednesday and on Thursdays, " and Luciano nods his head as he drinks the great white wine Vermentino, "Yes sometimes it is fun and yet sometimes...." he trails off as he gestures toward his nephew. "Yes we forget that it is a business and let me tell you running a restaurant and wine bar and a kitchen with fresh products everyday and a elegant hotel that the guests must be happy with, all of that reminds us if we do happen to forget" says Fabio. 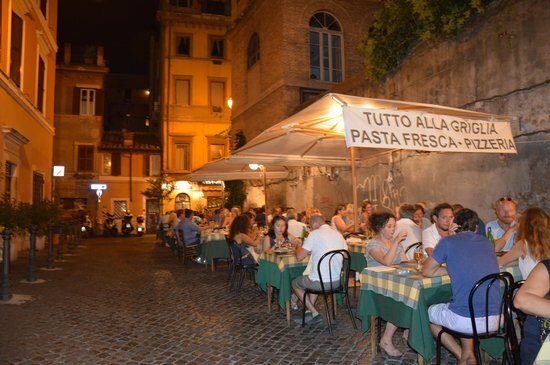 Trastevere is such a traditional local section of Rome, and yet although the tourists have discovered its existence in huge numbers, thanks to the tram number 8 and 3, it remains a family historical place with tons of great restaurants that serve only fresh products of the region Lazio. I tell Luciano the one thing that I loved is the fact that when you walk into the little elegant wine bar entrance you are immediately greeted warmly and with friendship by Sandro who smiles and speaks Italian waving his arms constantly. "Yes he only speaks Italian and he is always happy and always smiling and if he sees you don't speak italian he starts gesturing with his hands to help you understand him. Always happy. In fact we are all always happy here. We love the guests and we're always sitting with them to chat as they are our friends when they come here." The famous Chef with the colored hat, Diego, and his buddy Sergio in the Casa Mia Kitchen. Diego says, "Every Thursday I make fresh gnocchi in front of the guests, yet when you eat my food it is all fresh and prepared the same way as when you see me in front of you. And you can watch us make your dinner in the kitchen window, if you wish." 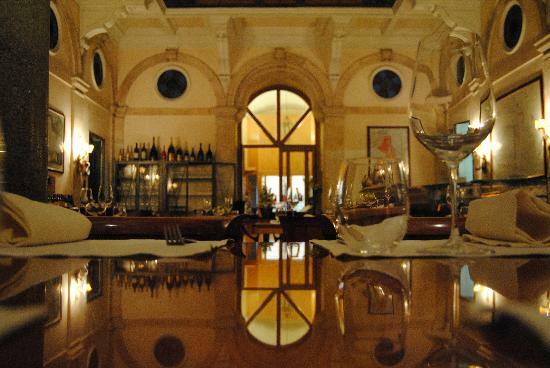 "The food is local products, done simply and with the Roman traditions. Every one of the plates. We have Tripe on Saturdays and Fish on Fridays and Gnocchis on Thursdays...and if you want a dish and Diego has the fresh products he can make it for you." says Luciano. On the one side of the hidden in plain site sophisticated Casa Mia Trastevere is the quality of a 3 star hotel, with Giorgio and Fabio at the helm! The lovely rooftop terrace room...romantic! "We have 12 rooms and one is a triple room that is at the top with a terrace that the guests can enjoy all day and night seeing the garden below. The garden is open 24 hours to let the guests relax in the fresh air and open to dine in for the outside guests from 11:00am to 12:00am Midnight." Courtesy of Fabio, Luciano and the very Italian only speaking, Sandro! : the bits and pieces of conversation that went from the garden to the wine bar to watching Diego make gnocchis to eating the gnocchis(one of my favorite parts!) to drinking Vermentino wine as Luciano ran home to his very beautiful Donatella, to chatting with Fabio as he wrote the chalkboard of the day. The first couple of years I interviewed Nicola, Mama Venerina's son and Domenico, and last year had the lovely experience of eating lunch with the matriarch herself, Venerina. She is gracious and kind and yet when the "boys", meaning the very capable Capos, Domenico and Nicola say let's do this or this, it is essentially Venerina who says yes or no! "Yes my grandmother rules with the iron fist and when we started to remake and open the newest very chic cocktail bar and restaurant that is fresh and young and not like the other Trattorias or Osterias named after her, she kept insisting that it be named Venerina. It is her namesake, afterall, yet the youngsters named it Passpartout which means the keys to the rooms. The newest addition is to have 12 rooms and a rooftop deck which opens in the new year, and tomorrow night, the 25th of October is the opening party open to the Public, yet it is open now if you want to do lunch and dinner," says my newest intro to the family, Camilla who is the daughter of Domenico. Just a little FYI, as I am walking from the Mama Venerina where I interviewed Camilla today, guess who comes walking briskly OUTSIDE near me with purpose and PASSES me? You guessed it right, MAMA VENERINA, who has received finally her wish for the naming of the restaurant, PASSPARTOUT! So after all, Mama Venerina has gotten her wish, MAMA PASSPARTOUT! Basically at the Mama Venerina you can find the Pizza, Pesce menu, Pasta Degustation menus. Il ristorante Mamma Venerina a pochi passi dalla Basilica di San Pietro, IS "a BAR ESSENTIALLY, although it does look like a restaurant, we had the first Venerina eatery here and it is a bar, and we have the Osteria Venerina and the Restaurant Venerina. Since my father runs the one here that is the one that I am at and if you come tomorrow to the opening of Passpartout on the 25th you can find me!" Says Camilla who is a very gorgeous girl that is only 21! and loves her family, the business and of course her Grandmother! Restaurant Venerina has some of the best pesce and seafood dishes in the San Pietro area and if you're lucky maybe you can have fresh pasta made by Nicola himself, pictured in the video! Open to public opening party from 19:00 pm to 23:00 pm and everybody is invited to come and drink some great aperitivos and fingerfood that is going to be typical of Passpartout, the newest Nonna Venerina's success in her long lineage of restaurants of the Borgo Pio region in Rome. http://www.osteriavenerina.it/ at Via Mascherino, 80, you can find great Roman dishes, the best pizza and did I mention tons of crazy fun! "You know me and my brother and cousin are the 3rd generation and we all love learning the restaurant business and being a big part of it. We as the youngest ones are especially excited to be a part of and help shape the newest restaurant, Passpartout. My other cousin, who is Nicola's daughter just graduated and she doesn't decide to do the restaurant business yet. Maybe in the future. Me? I love it and I have fun and I say to my Nonna when are you going to retire and me take over and of course my Nonna doesn't think this is too funny or possible at all." says Camilla. You come with Camilla's cousin to eat at the Osteria Venerina, you might end up in a cooking class learning the tools of the trade! It has been such a famous institution for so many years in the San Pietro area that it is always super busy with waiters zooming in and out of tables carrying huge bowls of pasta and specialty plates of the day or the famous pizza, yet they're always smiling, laughing and friendly. "Alright we are the 4th generation and the family started in 1922 with a wine store where the people of the neighborhood could come and fill up the wine bottles," starts the funny afternoon of talking to Enrico and Giorgia who are the children of the 3rd generation of Del Frates, Fabio and Dina. The first being Umberto Del Frate who opened the neighborhood Wine and Oils(big vats of olive oil) and although it soon became very popular, it was the first ever to open in Rome, Italy. And the family carried on the tradition when, in 1994, the father converted the wine store holding the vats of olive oil and wine into the store that it is now with over 3,000 wines and a chic restaurant to match. "Of which our cousin, Fabrizzio is the head chef." laughs the two grown children as they explain the way that the family helps each other to grow. Today at the Del Frate Wine Shop work grandma Elda, Fabio and his wife Dina and daughter Giorgia and Fabio’s son Enrico, the youngest of the family at the age of 24. "It is as if I am coming to Christmas Dinner everyday since my entire family works here, including my cousin, Fabrizzio who is the top chef and he is the best," says Enrico pictured here with the fun loving team of Del Frate. "Above me is the first t-shirt that we made when we opened the restaurant!" laughs Giorgia who asks if they can sit in the little adjoining alcove that connects the huge wine store with the restaurant. "The menu is sophisticated and the happy hour from 18:00pm to 20:00pm has such varied tapas as meat tartar and tuna tartar, Very special are the supplì alla puttanesca with creamed codfish, or supplì cacio e pepe but also supplì all’amatriciana. 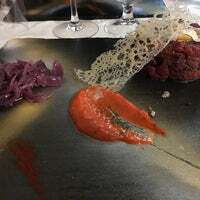 And the rich menu of dinner is creations from our cousin and star chef, who does fusion with traditional, such as Calamaro scottato, patate aff�micate e cime di rapa € 18,00 Trancio di spigola, finferli, carote e amaranto € 20,00. We invite the public to come and taste the tradition of the wine. We started as a family of wine and now with over 3,000 to choose from, I am sure you can find something you love. We know wine. We compliment the wine with the food. Not vice versa." says the two very cool and fun kids of Fabio and Dina. Hope you enjoy dinner. "Girls, they love that wine..."
and transformed into a dining place with tables and chairs during the night, they do buy the more expensive ones. Perhaps it is because they are surrounded by wine and spirits from everywhere in the world and they love the adventure of something new!" says Enrico. "We have aperitivos at night outside and you can have a little something to eat and a glass of wine or spritz." "The best part of the job is actually when we can visit the champagne companies since they invite us to come a couple of days and we can meet the owners of the champagne vineyards and taste the great bubbly. I especially loved going to Scotland, which I love. I love the people and the country and I love the whiskey. I got to taste some great whiskey and the coolest thing is to learn about it and to introduce the whiskey to the guests that come here to my restaurant," says Giorgia. "Yes and my mother got invited to a big party in Rome the night before the Beyonce concert since it is hosted by Jay-Z for his champagne." says Enrico. They start laughing when I ask if his mom got pictures to show with Jay-Z and Beyonce? "Yes, of course, Beyonce was begging my mom to take a photo with her," laughs Giorgia and when my eyes become wide she adds, "I was joking! Yet she went to the party and since we are a big buyer of champagne that is why they invite us!" Romeo Romeo where for art thou Romeo, meet the owner of the all encompassing tour company, whose name is Romeo! "For 14 years I have had tour companies in Rome, and every year the tourists say to me, "Where can we store luggage? so I have luggage storage, or "Where do we buy train tickets and which ones are the fastest?" and so I have train tickets on high speed trains, and the backpackers say, "Do you know of any buses around Europe and Italy?" and so now I have FLIXBUS and EUROLINES and every bus company that you can purchase from me. I ask my guests, the tourists, what do you want in terms of the beautiful tours of Rome and Italy and they tell me. Yet the world is bigger and they ask more questions and now I have the answers," laughs the very friendly Romeo. As we talk a couple about 65 years old come in, educated, dressed well, and ask in English where is a Western Union! "Yes, I have Western Union and Ria and Money Transfer, etc. I make sure the tourists have all the resources they need to ENJOY ROME!" Yet if you need that Western Union to travel to Venice or Florence or Milan or Naples and Pompei, he has tours for these cities, too! The best way to find Italian cities, FLIXBUS! Where you can enjoy to see the Apostolic Palace in the Castel Gandolfo. It is located on the top of the Alban Hills viewing the Lake Albano, and is a famous host in the 17th Century of the Papal Palace, or the famous sacred Vatican Museum Tours, the Coliseum Tours, Venice in one day on the high-speed train and Florence in one day! Alright here it is and we have 5.00euro luggage storage from 9:00am to 9:00pm plus Hotels and Hostels Concierge service to help you find the right one, and of course the EmmeAnesBook Rome site to eating and wine! 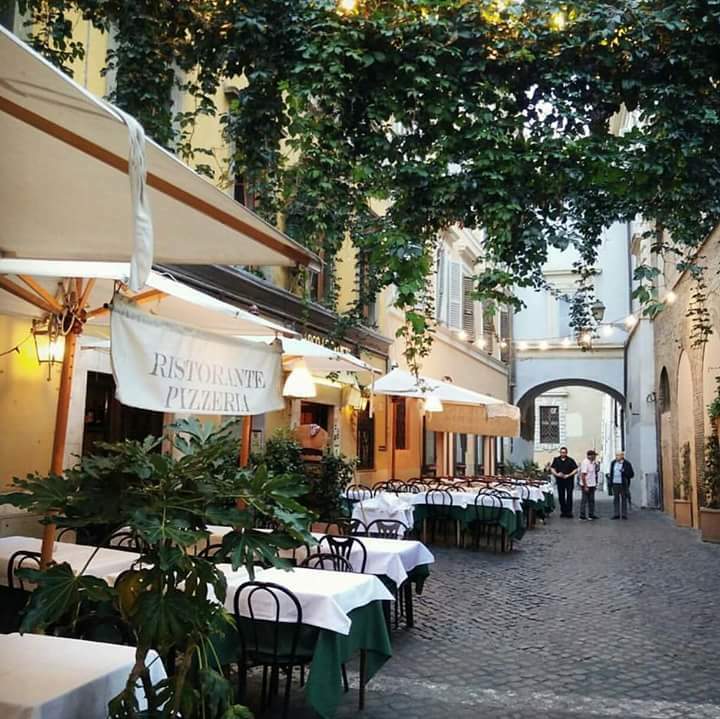 the famous Trastevere Restaurant that is steeped in tradition right at the base of the Santa Maria church and the Piazza, Arco Di San Calisto. I first met the family about 3-5 years now and interviewed the son and his father and mother, Franco and Carla. Since they speak mostly Italian, I had double blessings today of having one of the sons, Bruno's wife help with the English. Nicoletta is a doll and we had a lovely interview. "Every morning I come here and I do the mushrooms. Every morning, I chose the fish and the food of the day. Instead of going to the Mercato, the Mercato comes here. And I decide based on the food that they bring what is on the menu." says the father, along with the help of Nicoletta and Andrea, the oldest son. Andrea laughs and says, "Yes every morning he is here, sometimes I am here early and I help, yet for 60 years my father has been the Capo of the family. He is 80 years old now, if you can believe it! My mother is 71, and she helps him every morning too." Yet Franco jokes, "I love to see the beautiful woman come to my restaurant, that is why I do it!" Andrea says, "He loves to see the tourists and he his very happy that they have a beautiful lunch and dinner is what I think he means!" I still can't believe that every morning he is here. "Yes, " says Nicoletta, "the sons change, yet Franco is here every morning, with one member of the family. And the food? I love to eat it all. Whichever he chooses for the day is highest quality." she says. 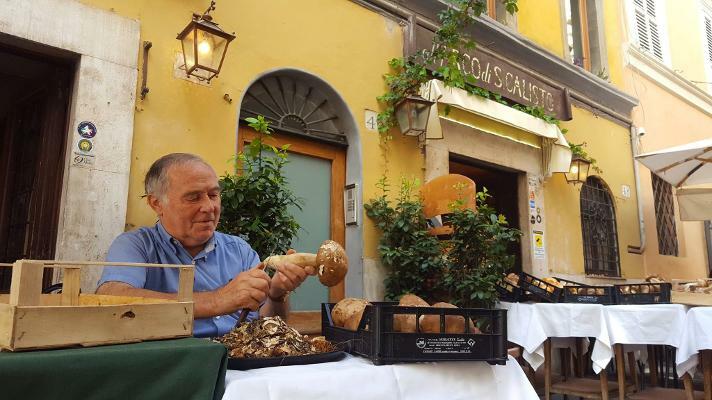 "My husband is the sommelier," says Nicoletta as we have a nice summer day outside chatting while Franco readies the mushrooms for the guests, "We have many wines, yet I don't know how many!" she laughs and asks Andrea in Italian. "Maybe 100 to 200 here." he says and the father speaks rapid Italian and says emphatically, "200." Somehow you know the father knows exactly how many wines, peas, fish, mushrooms the restaurant has at all time! "I reached my goal here in life. To have my family and the restaurant and 60 years of a great traditional reputation makes me happy. We all took a trip together to Los Angelos and we loved it, San Diego, too. I opened a restaurant near San Diego with a partner I love America that much." says the father and Nicoletta and Andrea laugh and say that they too love California! me too! 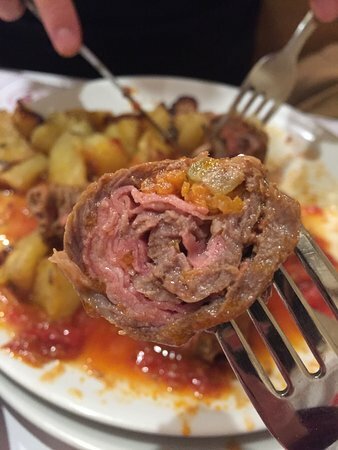 "The food is Romantriaciana," says Andrea. Hmm what exactly is Romantriaciana, which I spelled it right the first time...amazing, try saying it! "The Roman traditional food. Carbonara of course. Plus, the region of Lazio is rich in vegetables and the traditional meat of Lazio is known for its highest quality. 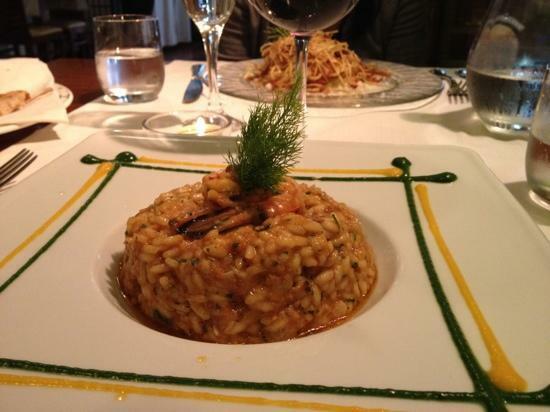 Where in other regions of Italy perhaps rice is the number one dish, here it is pasta dishes." And of course, fish. 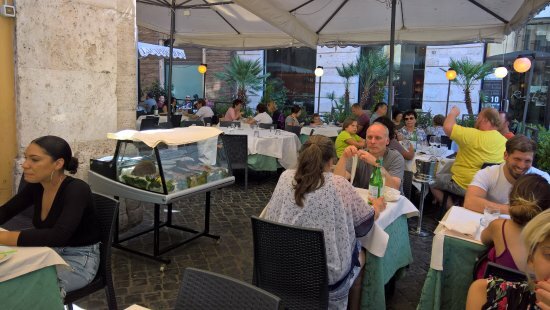 Any restaurant in Rome that presents fresh fish the moment you walk in , in a cooling case, is a high quality restaurant. The food here is exquisite. Simply. 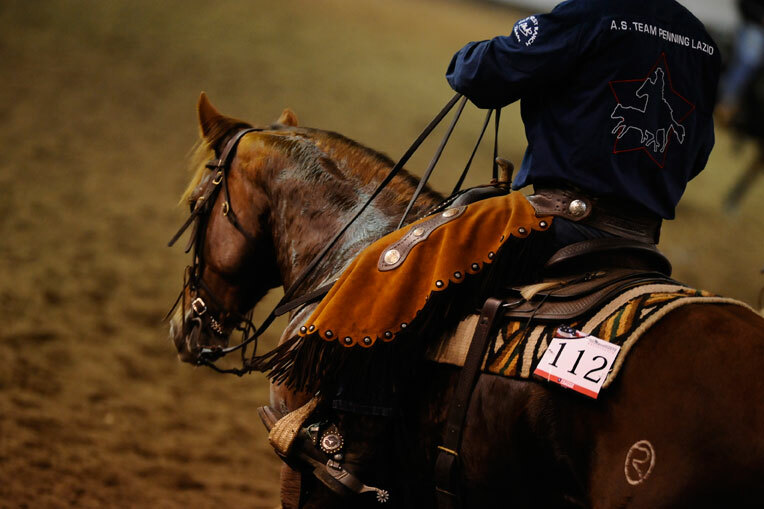 And check out Andrea's very cool other life...he is the President of the Rodeo of Italy Organization and they perform at all the major horse fairs in the country. "That is the way it is with Andrea, yet now his daughter is the captain of the team," says Bruno! As I approach the family lunch table the father, Franco and his loving wife Carla immediately recognize me and give me a glass of wine, which of course I graciously take and drink yet having had 3 glasses at the Vatican Mercato early in the morning I am saying, "I don't know if it is dangerous for the tourists if you give me more wine if I walk around Trastevere, to which Franco laughs and pours me more! "Actually," says Bruno, the 1969 son born to the family of 4 children and 9 grandchildren, "I am the sommelier and I wait the tables in the big dining room. Each one of us has a special job and the wine is mine. Mostly because I love to drink it!" he says laughing. Pictured here with me as the photographer took many pictures and we laughed. "We used to have a restaurant named Passetto, " says the father Franco. "Tell her about it." he says and Andrea enthusiastically says, "O yes a very famous one, all Michelin and etc. Then it got political and the pressure for the political people to come in and take over the restaurant was too much for us. We love it here. Highest Quality and the guests are great from the highest political levels today of Rome and the world to the funny tourists that just insist on having us choose for them. The other we kept the guest book, which dated back to 1860. It has signatures of Charlie Chaplin, Joh Wayne, Mussolini, Hitler, Charles Bronson, and the modern day ones such as Leonardo Di Caprio! O and my favorite is Don King! My father said his hair was so high he had to stand on a chair to compete with him!" jokes Andrea. Yet it is a great story! When I ask the second child, Bruno, to tell me about the restaurant he says, "O it is the same. We have been here now 52 years and it is always that way. I have seen others change and not for the better, yet us? We carry on the family tradition and keep it Italian. We're involved in many things to do with Italian culture, along with Andrea's daughter carrying on the tradition of the Italian Rodeo, and the neighborhood community projects that we do. The others don't live the Roman Italian tradition, yet we do and that is why we continue to succeed with the guests. Every year the Americans come and the Germans and South Americans and Russians and Europeans and the Italians. They love us and we love the guests. We serve homemade traditional Italian food with love and with the same passion that my father and mother of 52 years do. And now we have the youngest grandchild who is Leonardo and he rules the dinner table." And it is true as during the interview Leonardo, the 2 year old capo of the only daughter of Franco, continues to pound the table and demand attention and laugh when you give it to him and yell when Grandma leaves him! "yet people know it as Al 34 so then we must keep the tradition since it has been here since 1968." says Nicola as he remembers the last year interview right before he left he next day to fly to his Lincoln Park Home in Chicago. I remember that as well and ask if he loves Rome or Chicago. "Being the boss of such a traditional and famous place is stressful and when I go on vacation it is only fun. Very different." he says. 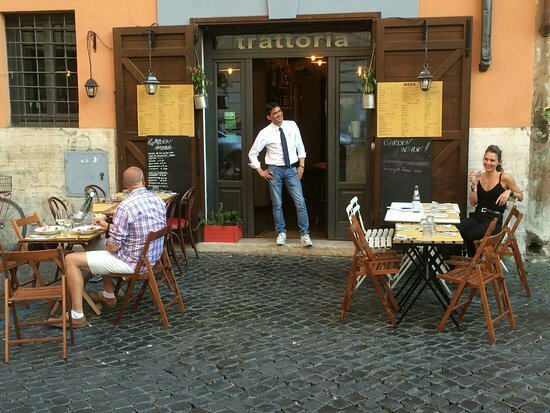 Located near Spanish Steps, the famous picture spot of Rome, at Via Mario de' Fiori, 34. "Everytime I go away I try to learn new cooking recipes from famous Italian schools, yet to be honest, I love the recipes from the little grandmother who makes tortellinis her own special way. That to me is very special and only a couple can do that. You know when I went to Chicago I thought of taking some Italian cooking classes too, since they do fusion and us Italians are so focused on Italian Italian Italian our way!" he admits. "I enjoy learning new techniques and bringing these techniques to my guests, yet my mother is the taster since her and my father started the restaurant and she always says, it has too much salt, change it! And of course the saying having too many cooks in the kitchen is challenging sometimes. As with all Italian families that work with each other, we clash at times!" says Nicola as he laughs. "Why do the guests keep coming back? They love the food guess, although I wouldn't say that we are the best in Rome or Michelin. We're a traditional family restaurant where every plate my mother checks before and after from the kitchen to the table and lets me know about it if someone isn't happy. I am daily trying new recipes and my menu is very big since I love to play with food, and some people say that I am famous since I have written cookbooks that people actually use!" he says. 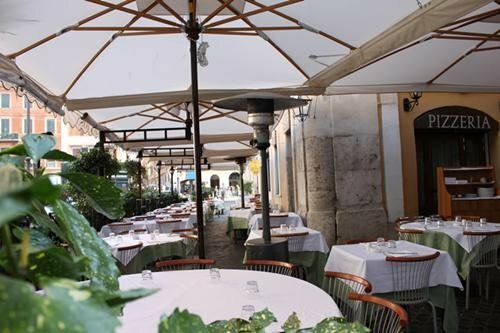 As I am very picky of which restaurants, enotecas, funny tours, leathers, cheese and wine stores, etc adorn my Rome site, I am happy to have the restaurant on the site from 2018 to 2020 and hope you come and meet these people as they are a lovely family that is always present, friendly and kind. Especially kind and the food great. "My restaurant is about memories and the cars on the table bring back memories of that childhood. Perhaps they were different cars or toys I played with yet it is the feeling of that childhood life that I love and when people come into my restaurant I want my guests to feel immediately comfortable," says the lovely Capo of L'Arcangelo. Whenever I approach a restaurant that has Michelin stickers on the door and window I am a little intimidated since I always expect the Capo and the Chef, especially, to be real snotty! Yet, although Arcangelo(his real name and the name of the restaurant) is totally serious, he isn't snotty. He is very intense about his food and his craft , yet he is approachable and interested in what you have to say and in what he has to tell you. His restaurant is one of these before and after theater, you know, the kind that is a little dark and mysterious and you are awaiting that great production, such as his famous recipes that he says he likes to be a little creative with. His walls are adorned with relatives from the "old country", and the real old photographs are so cool to browse that you don't mind waiting for dinner. I would say that reservations a must. When I entered the restaurant L'Arcangelo today only Nicola, Arcangelo's wife, and his assistant, Hoxha were laughing at the counter. I said hello and we chatted about Nicola's famous husband who now has 3 restaurants, the famous Michelin named L'Arcangelo, the streetfood for young people named Supplizio at Via Dei Baqnchi Vecchi 143, and Ora da Re Bottega di Cibo Di Strada at Via Dei Coronari 25. 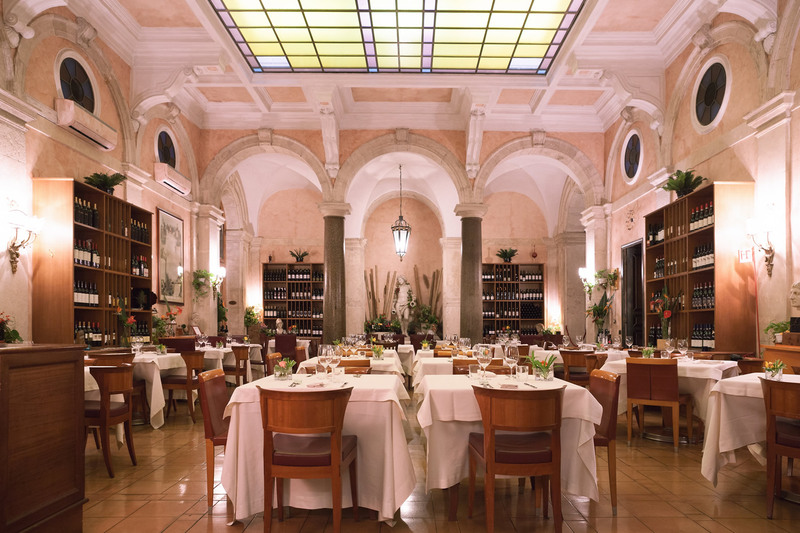 At least we can celebrate in style at the L'Arcangelo in Rome! Just sprinkle a little bit of Arcangelo's magic recipes in the plate and a freedom of relief beyond belief from the reality of everyday stress! It even has little cars you can play with if you get bored waiting for Arcangelo's creations! His assistant helps me with the translations between Italian and English and she says that "he is very happy about his restaurant and the beauty of it. He loves his food and he loves his guests. He is the master chef, yet he is always out of the kitchen trying to talk to the guests. He is at the table more than the modern chic kitchen that he designed. He chats with the guests and laughs with them and his wife has to remind him to go back into the kitchen and make the food for the rest of the guests." "The food is a lovely experience and the cars is about the memories," he says. That is the reason for the cars on the table, not necessarily that he played with cars as a child, yet the memories of childhood. That is why each of his creations has a touch of memory to it, maybe not exactly the way that your Italian grandmother, or your best friend's Italian grandmother, or you're next door neighbor's Italian grandmother made it, yet the memory of a little touch of something in it, is what makes it special. "Every morning I ride to the Mercato and pick up 3 special herbs that they save to give me. I am the only one that uses such special herbs and that is the secret to my success and the Michelin status restaurant. I prepare such uniqueness and the people come from everywhere to experience my food." says the lovely and kind Capo. Supplizio is Arcangelo's first Street Food Corner where he said it is his desire to be closer to the young people who perhaps don't want to do a Michelin Restaurant for lunch and dinner and are very happy to be presented with the great chef's food at a price that he can afford. Here he has his passion for Suppli, which is the street food name for excellence and the ancient Roman Traditional cuisine. 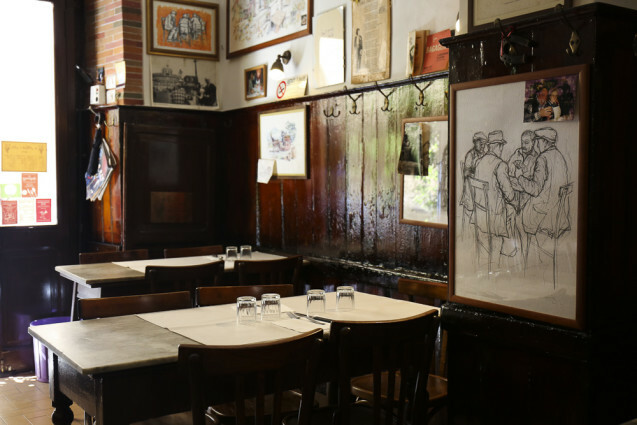 Here is a reflection of the chef's need to honor the tradition of his 4 generations of restaurantuers in Rome and the atmosphere is one of a rustic living room. Voyage côté femme. Roma. Trattoria der Pallaro from Teresa Lagerwall.Journalist on Vimeo. 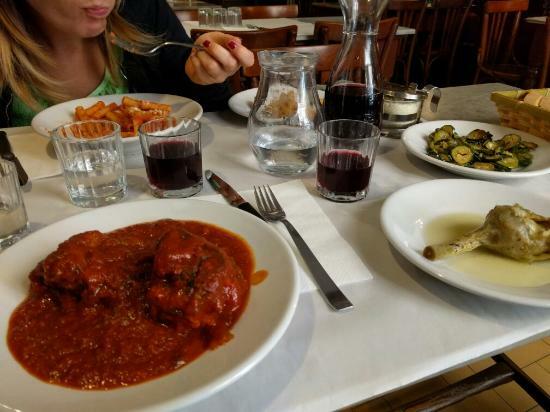 It is VERY OLD FASHIONED TRADITIONAL TRATTORIA located in between all the fancy modern hotels and restaurants in the trendy Campo Fiore and Lady Paolio has been the Top chef and Cuoco the last 56 years. 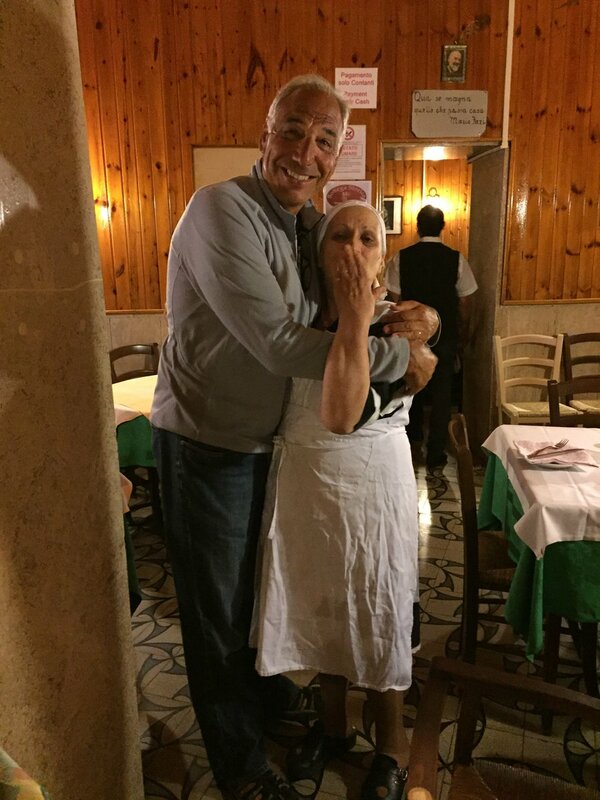 You know from the Community of Rome, she has received 1 of 3 awards ever given to chefs in Rome that have been at the establishment 50 plus years without changing restaurants, named the famed and prestitious, Bottega Storica. The restaurant has a cool VERY LOUD outdoor cobblestoned terrace and cozy heavy wooden rooms inside. When I ate at the restaurant in May of 2017, a couple of people sat next to me 2 hours and were celebrities from New York(very famous ones). We had much fun talking about raising children and living in New York! Very normal, yet unusual conversation you would imagine for celebrities and they loved the character, Lady Paolio and totally appreciated the family way the food is served. Lady Paolio only speaks pure Italian and understands Italian, so you better either brush up on the Italian or bring a translator, and the waiters are about the same. 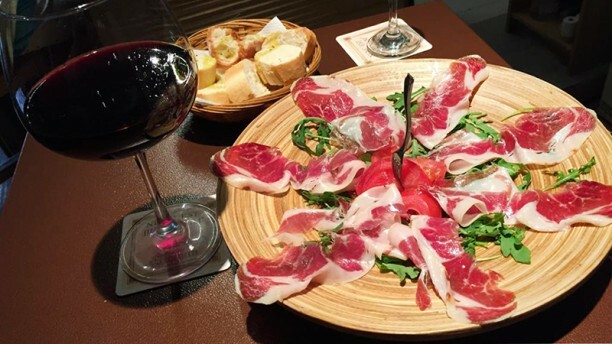 The good thing is that the menu is the same with a degustation friendly taste of Italy and many courses for only 25.00 euros per guest. It was 25.00 euros 10 years since and it is 25.00 euros today! If you ask the Lady Paolio to take a ancient walk down the stairs below the restaurant where a historical protected room and caverns of Julius Caesar is undisturbed except from the tour groups that walk through the restaurant, push back the table and chairs against the closed glossy wooden doors and venture downstairs. I took a group of 5 20year olds from a college group of 30 yesterday and they loved the fact that Julius Caesar actually worked and lectured to his fellows down there! It is dusty, musty and authentic, the room below and very contrasted to the modern life of the busy restaurant above! let's face it...tours are tours! WAIT! how about painting your own masterpiece in a wine and painting 3.00pm class! Mufasa is the capo of "MAYA" tours, "I started the tour company in 2007 and it is almost 12 years now. I heard many tourists ask about and helped many when they asked about the interests of Rome. And finally I said alright let me start my own company. Now it is 50 tour guides with me that do personal tours of Vatican, Vatican gardens, Vatican garden buses, Night tours, Food tours (yes it is dinner), Colosseum, Roman Forum and Palatine tours, and the cool guided sunset tour in the ancient city center of Rome." Now today, when I said Hi to Mufasa, again, he immediately says, "Do you want to do a Vatican Tour?" And I said, "Right now?" Mufasa says, "Yes, here is the little button," and he sticks a red Maya tag on me and pushes me to join the group, led by a entertaining blonde guide named Deborah. The group had to have at least 30 people in it and although that big, the guide kept us from losing each other most of the time! The tour is a must. I had never been in the museum part of the Vatican before and certainly not the Sistine Chapel. A couple of times I tried, yet it always seemed to be private or closed to the public on the days over the years that I tried. Now today, spontaneously, here I am on the Vatican city property! I LOVED THE VATICAN: the tour guide was non-stop talking and very informative and included in the tour was audio guide , too so we could hear. The statues and the priceless collections of original art and frescoes is unparalleled and we got to see and visit the gardens, too. It is a amazing tour of about 3 hours and worth every penny that you give. It is a once in a lifetime tour and I can not say enough good things about the tour or the tour guide. Amazing, informative and totally awesome. https://www.mayatoursroma.com/it/"We have the Coliseum and Forum and Palatine tours and we have tours in 6 languages plus if you call and ask us for a language that you speak such as Arabic and Chinese, we can do that too. Just ask." says Mufasa. "Why do people love us and use us? Because we are very knowledgeable and have 50 young guides that are fun and happy to guide you. Because we give the rare historical tours, yet fun and new ones to interact with the culture of the city such as art and wine and food!" says Mufasa. Mufasa is so sweet and nice you will immediately fall in love! The Coliseum is one of the wonders of the world, and to walk inside it, as I have done on a tour, and privately, is amazing. It is such a huge structure, yet it has so many human memories and everybody that I have asked these last 10 years if they felt the sense of what had happened inside the walls of the Coliseum when they visited, everyone said yes. The Maya website says, "Enter the ancient Roman arena, where gladiators battled to the death, emperors reigned from hilltop palaces, and bronze statue-filled temples were worshiped by abiding citizens. " and that is totally how I feel when I walk around the coliseum. 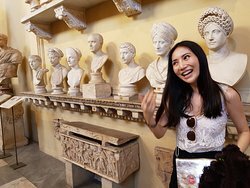 With the tours starting from 40.00 euros to a private tour of the family of 3 hours at 250.00 euros with walks in and around the Roman Forum ruins and Caesar’s Palace, you can find a tour for everybody's comfort. 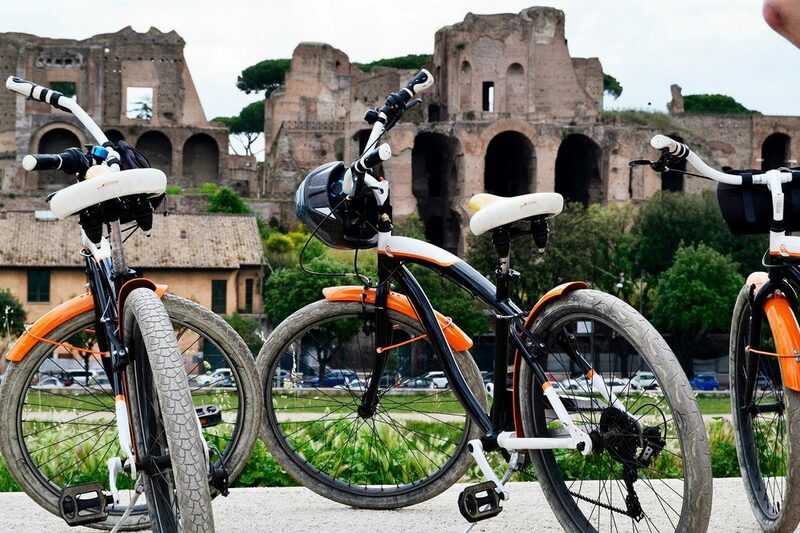 And everybody knows that I love biking and food and the Maya tours combines these for a great day out, and personally although Rome is such a beautiful city that walking in and out of the ruins is pretty cool, yet biking is more fun and fast! LA CAPRICCIOSA, ROMA , down from Via Del Corso, opposite Addidas. Reservations if you wish, or just mosey down and have a aperitivo while you wait! "In 1937, the restaurant is born and is the famous pizza. The war happens, and we still carry on. We are the 4th family to own the restaurant since 1991 we have owned it and we are very happy with it. We have fun. It is a family restaurant and even the wifif passcode is to the guests!" says Marco! 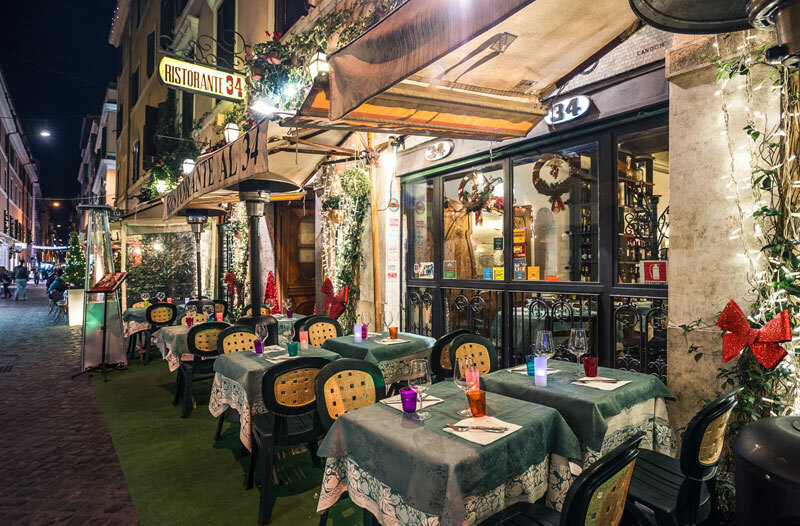 OKAY, you must find the restaurant, head to the Spanish Steps and wander or mosey down the Via Croce cobblestoned alley to the end where you shall see the garden restaurant with awnings opposite sitting peacefully waiting for you! It is such fun and while I am there at least 5 couples came to eat, young and happy and laughing with the funny google translating happening. Marco and his wife are the nicest and coolest normal people. Try to learn a little Italian or at least bring your google translator and attempt a conversation, you will have a lovely lunch, have fun and if you come from now til December, please give some good tips and suggestions as to what to do with a family in the snowy New York city and the hot Miami! I stumbled upon a Jewel when I came to eat today, a lovely restaurant tucked away from the hustle and bustle of the retail gems and the Spanish Steps, as I am waiting to chat with a favorite Capo, named Maurizio. 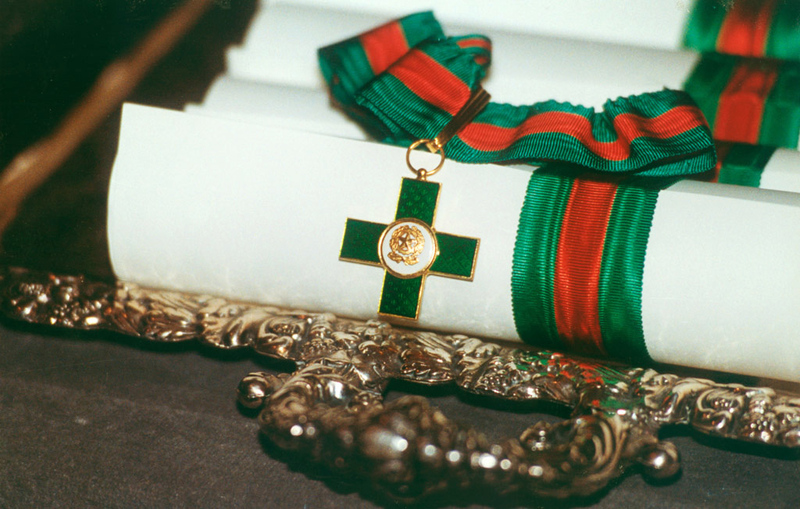 The name of the Jewel is La Capricciosa. I found the Capo, named Marco and his gorgeous dark haired wife who told me they are planning on going to New York and Miami(my city) in the winter. What I didn't know is that the restaurant is of the 4th family owned and it started before the War in 1937! The famous pizza was born here, and if you wish to order it, "it is the most popular item on the menu. 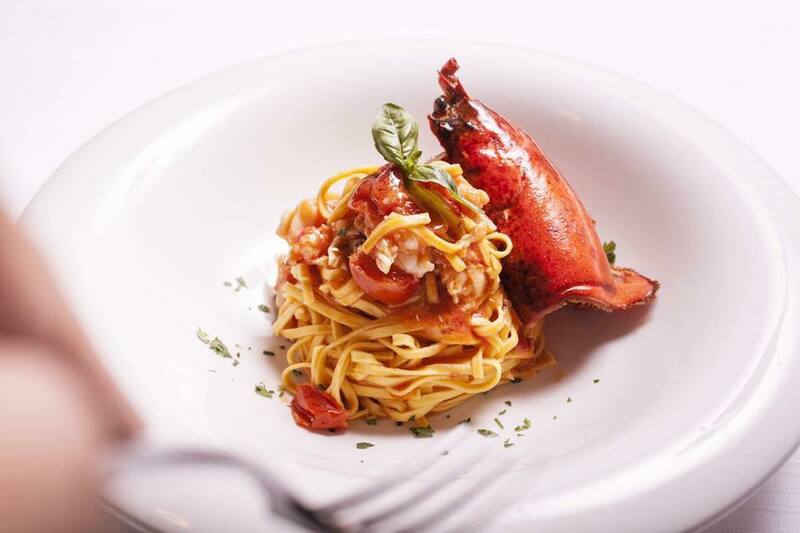 Of course we have the traditional items such as amatriciana and the carbonara, and we have fresh fish on display everyday, yet me and my wife say that people must come here to meet us, although we only speak Italian, and to try the La Capricciosa, which we are famous of." laughs Marco. By the way, we GOOGLED TRANSLATED the entire interview the entire 1 hour and had a ball. Met his beautiful wife, had giggles on my google translating asking Marco to "ACT LIKE A CHIMPANZEE!" and which Marco raised his eyebrows and said, "a chimpanzee?" and which I said, no no, it is google translating something strange! A great interview of east meets west and finally me saying I shall organize the family trip to America with fun things to do! As with photos, we only see the picture, yet WHO IS TAKING THE PHOTO? THAT IS THE QUESTION! Which of course comes to the question of the chef? Marco? His wife? His mom, sister, dad? He laughs, "I am the manager and I say hi to the tables, although I speak in Italian. My team speaks, German, English, Russian and Arabic!" he says. "And we have a professional chef, you know we want to eat too!" HA! "It is funny since the Germans always drink Beer, and the Italians always eat pizza and drink beer, yet the Americans always ask to drink wine. They come to Italy and they say, we have beer at home, we want the best red wine, the Chianti, the Moltepulciano, and we only want the red wine. Bring the pizza, the pasta, the steaks and bring the red wine. They don't care about the white wine, they won't drink it. They want red wine and they want it from Tuscany. We laugh and actually since we really like the Americans, we ordered more red wine from Tuscany to the menu. Me, personally, I love the California wines. That is why we are going to visit America in the winter. I want to bring my family to New York and Miami. I have a 10 year old and a 15 year old and I want my family to see America." says Marco and I promise to give him a great suggestion list. "And yes, they want pizza, yet they love the Italian food, all of it!" Chiara's father helps in the morning to prepare the food for the day yet she says, "When I am on the day it is a lot of responsibility or if I am sick the restaurant doesn't open. I am responsible for my Cuoco in the kitchen and I must try to come here everyday. I close the month of August the entire month and in August we go on vacation." she says. "Vietnam and Cambodia and Thailand is cool to go on vacation to and actually my favorite. In addition I loved Mexico, and thankyou very much the Mexican people that visit here always invite me to vacation with them!" she says. 06 687 8842 is the number to call for directions, yet reservations? Chiara laughs, "Are you kidding me! In my little place! And on Sundays and Mondays I have personal days." I say that is music to hear she has fun. "Yes I used to go out on Fridays and Saturdays to have a glass of wine with friends, yet I work such long days, from 12.00lunch to 22.00pm is the kitchen open. Now I am thinking that maybe I can have a person help on a Friday and Saturday and go see a concert or something fun to do." "I've kept most of the pictures from my grandmother and grandfather just the way it is today. I added some sketches and some of my little personal touches to make it mine. Here the notice says that in 1931 you were not allowed to play card games and it lists a ordinance that every place in Rome had to adhere to. These items I kept for memorabilia." Food? Heavenly. Chiara? Delight. 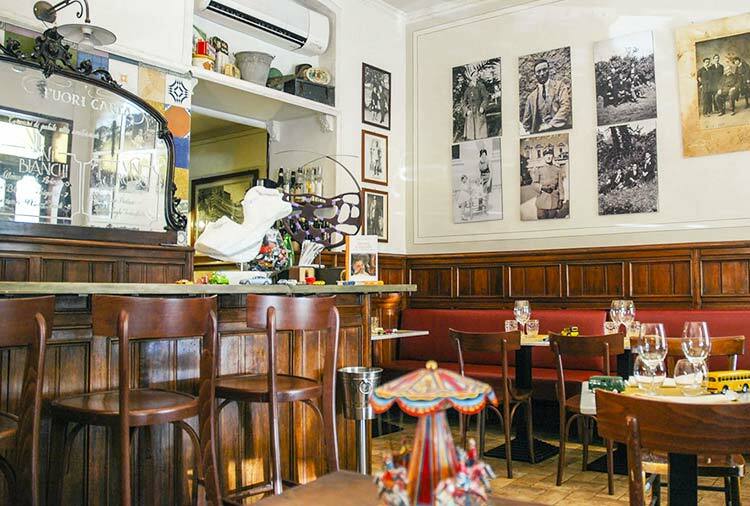 The charming totally authentic traditional Italian kitchen and Osteria is located at Via dei Banchi Nuovi, 14 and how lovely it is. 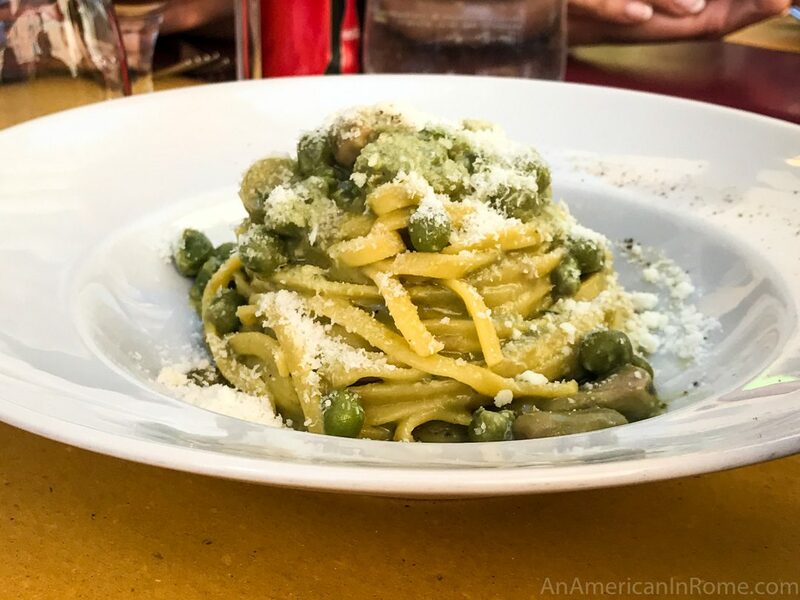 From the only person that you shall see and talk to, aka the Capo Chiara above, to the cuoco in the kitchen, it is a real Italian home that you come to eat at. "My grandfather and grandmother bought the restaurant in 1946, yet it started maybe in 1930s I suppose since they bought the already existing wine service from a farmer that had the vineyards. The vineyards are small and about 50 minutes from Rome. They would bring the barrels in everyday and they would resell wine. At that day in 1946, my grandmother and grandfather only sold wine, yet a couple of years since the theater around the alley opened and they started running food back and forth to the actors. That is when they started having Italian cooking here since they already cooked for the actors they decided to cook for their guests!" says the very beautiful and totally charming Chiara who I interviewed from 22.50ish pm to 1.00am at the little Osteria. "My tables have paper on each one and people draw and write letters and doodle everyday and give these to me. They send me letters and postcards from around the world and they invite me to every country. It is amazing that I stay here to give my guests my cooking, yet the world visits me. The world revolves around my restaurant! "Chiara says. We had so much fun drinking wine and chatting til 1.00am. I learned about how the process of turning a little Osteria of wine and cheese into a homemade kitchen with a spotless reputation happens. How a young Italian girl who went to college and started working in publicity is now the Capo of her own Osteria. How life continues on. Charming. The very fun cold Bar named the ICE CLUB of ROME And for fun while you are starting out your Eternal City Night of going out to dinner or drinks, a must is a once in a lifetime 25 minutes of 5degrees in the famous Rome ICE PUB that has ice sculptures of the eternal city! "I was thinking of doing a Vatican Ice Pub since I have been here over 17 years now," says Agostino who is the very nice and friendly owner, "yet the Vatican is so small I don't know where I would put the Ice Pub!" When I laugh and ask if he can do Vatican Statues of Ice in his Rome Ice Pub he looks at me as if that is a sacreligious question! "They are two very different cities and if you are a Roman native you must remember that!" Ok! O hey when you are cold, you must drink a lot of alcohol and for 15.00 euros you enter with that cool space age thermal suit and drink up, making tons of cool, no pun intended, friends along the way. It is way too cold not to talk about the cold and after you chat about how cold it is, you can all go out to dinner or drinks! Close to the 100 Montaditos near Collsseum, down a little alley in the section the Romans call MONTI! The cool suits keep you warm, yet the record is a couple of hours inside the Ice Pub, while about 25 minutes is perfect. I believe that the bartender is either from Alaska or Siberia! They have premium vodka, of course and lots of cool ice sculptures to take photos with, too! 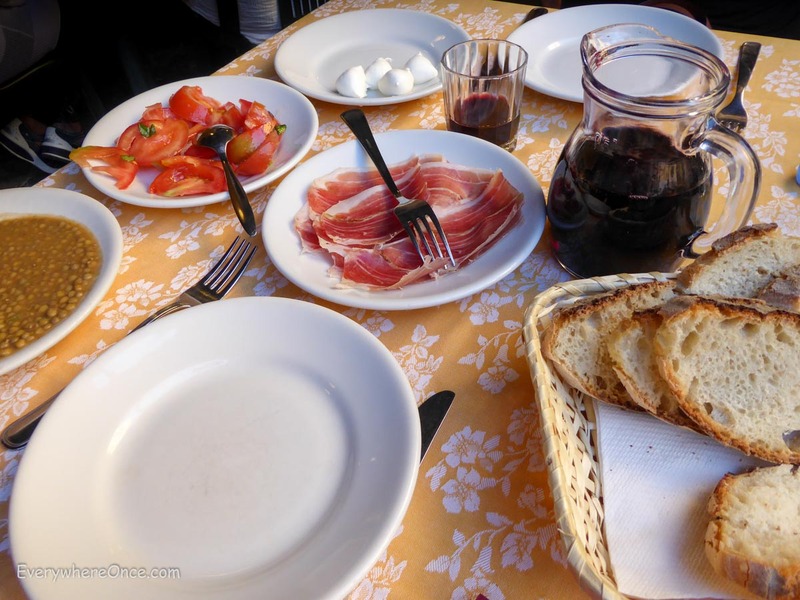 "The food is Roman yet we have a little different presentation with the wine and the food. The wine is chosen from me and I try to visit as many small wineries as I can, in addition, I have many who come here and invite me to the vineyards. All of the wine is found in Italy and I am usually the one who finds it!" she laughs. "The wine usually can not be found in the super markets ever. If you love the wine here you should either buy another bottle, since the vineyards rarely make more than 300,000 bottles that I chose per year, or ask me for the contact of the vineyard and I can give that to you." says Mariella. "The food is from many regions of Italy including, of course, Rome, yet we needed to respect the Roman tradition as that city hosts us, and at the same time do our own cuisine, and the menu has items from Sicilia, Emilia-Romagna, Campania, Piemonte, and Lazio naturally. The chef does an amazing job presenting the plate. Simply beautiful and I love when people take time out to compliment me with the things that they do write. They send me emails from America, as I told you, and always ask for the place where they can buy the wine. I am very happy to hear guests when they come for dinner to say someone recommended their visit. As we are usually only open for dinner, I guess we can be a little more elegant at night and I try to be very personal and professional with the table." she says. "In addition, the team speaks, Italian, Dutch, English, Spanish and French! I speak 3 languages and Francesco, the waiter speaks 5! So, it is truly a bilingual restaurant where everybody can feel comfortable." Mariella, the lady Capo, is very formal and professional as is the first impression of the swanky copper gilded restaurant, "Yes I added the copper 16 years ago since I loved working with copper. I grew up in Naples and Rome and the United States where I was a journalist! Yes believe me,"she says laughing since I am a real journalist! "When I came back to Rome I met my partner, Guido, who asked if I wanted to open a restaurant with him and I said yes. We started the Taverna Angelica 16 years now and the copper touches on the tables and walls have been here since then. My good friend is a artist and the pieces of her art are mixed in with my copper sculptures on the walls. I think it gives it a elegant mood to the restaurant." I do too since the restaurant is beautiful and in 2007 received its first entry into Michelin. "What I really enjoy is when I present a wine to the table that I have suggested would be good for their dinner entry and they love it. They always compliment me and sometimes email me when they are back in the United States and want me to ship them wine! That is when I give the vineyards email. They do that, I am a restaurant!" she laughs. A very elegant restaurant and a very nice team. "Yes my entire team is great and my partner is lovely and Francesco, who you said Hi to, is wonderful. The chef is from Rome, of course, and we work with him on the selections of the menu. He does 4 different ones, one for each season. We show you the menu on the website, too." she says. 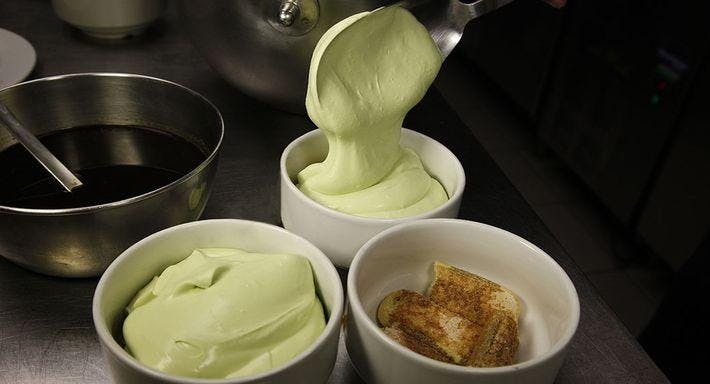 They use products from some of the best farms around the world and it is arguably the best restaurant near the Vaticano so please be prepared to make reservations and here is how! "The Il Falchetto literally means "little Falcon."" says Jerry and then he shows me a photo of his father as a young man talking and greeting the President of Italy, Sandro Pertini. "My father has known many important people of the political world." he says and I say that I love the name as long as it isn't "the falcon and the snowman" and then say "woops" as I see Mr. Donato with his white hair now enter from the kitchen. We all laugh at his white hair. "That is me as a young man." he says as he points to two pictures on the wall of him and Mr. Pertini. "We have the lovely elegant deck outside which is the favorite of the people to sit and observe the city and the three rooms inside which are really quite elegant. The one room you love is in the middle with the Godfather chair, as you say. And next to it is a private room, although it does look out to the garden. Behind my father's desk is the wallpaper that we made especially that has all of the reviews on it of important newspapers around the world. They are real articles that we had replicated to show to the guests. That is my idea and everybody loves it. And it is a family. My mom, Gina, goes to the Mercato every morning to buy fresh food and bring it back to the cooks. She really enjoys that much to do it. She just loves going to the Mercato every morning. And my wife is my right hand. She helps me with essentially everything and of course my father is the big Boss.!" says Jerry as he introduces me to his beautiful wife, Tiziana, who says she loves the beef at Il Falchetto and the Risotto with fish on the menu the most. 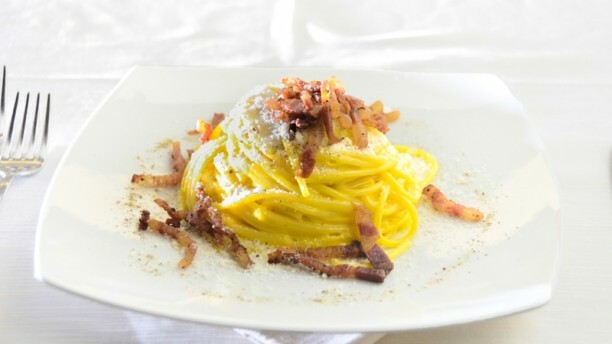 They give me a plate of Tonnarelli aglio and olio and peperoncino garlic, which is very spicy and very tasty and I would recommend it along with the house white wine, which is a very high quality to choose for the "house wine." The restaurant is elegance with a capitol E and I would make reservations soon before it receives the Michelin award and reservatons will become impossible! Sapore di Mare is the soft beauty of the restaurant as you step into the hidden in plain sight restaurant. It is a cozy stone cave a couple of steps from the Panthenon and famous Grand Hotel de la Minerve, hotel, http://www.grandhoteldelaminerve.com/. The outside garden is beautiful, especially at night where the greenery surrounding the private oasis open to the alley, yet secluded, gives a lovely glow to the candlelights. I met a totally funny couple from Winchester, England, who entertained me with stories of the Royal Family, their love of Robbie Williams, and Adele. They showed me a little video of Robbie Williams where they had gone to see him a couple of days prior in England. Now of coure we must talk about the Michelin Quality food of Sapore di Mare. I asked Giovanni, one of the three owners, the other Gino, and my lovely friend of almost 5 years now Simone, why the restaurant hadn't ever received Michelin..."I don't know, it is a perfect restaurant for it." he says in mostly Italian. 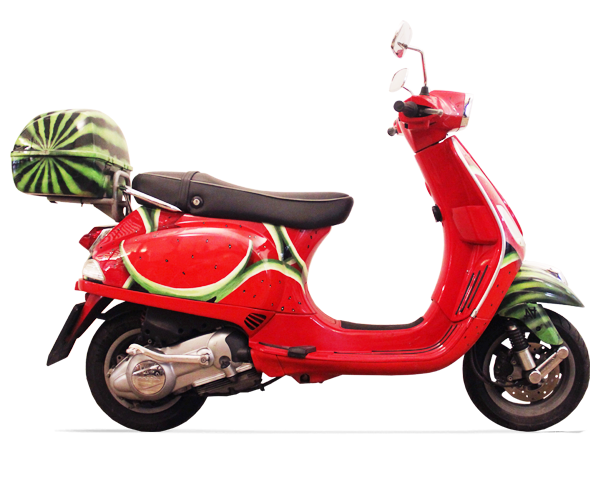 O yes, you will find the real Italians, here! As I entered I thought I recognized a couple of Parliament families with their children about 22.00pm walking in, along with the usual hosh-posh groups. That is a word my table mates named the guests..."they're kind of posh," the lady says speaking in upper-crust English. Simone much prefers to greet all the guests, to sit down and have a couple of glasses of wine with his guests and to chat. If we ever try to find Simone at night he is always at the tables talking. That is one reason that people come here. And O yes we forgot Gino Sapore Mare, he is the master chef. The Cuoco." "I guess maybe during the filming of Pretty Woman," says Simone a couple of years since I asked him about the famous pictures elegantly on the entry hall displayed. "My favorite actress is Meryl Streep and when she came in to dinner that is my night!" he says. "She graciously sat hidden in the dark corner inside and handed the plates to the waiter every time, a lady and she laughed and had a couple of bottles of wine with us. We had a great evening. Afterwards, I named my most expensive plate after her, the Meryl Streep, which feeds 10, costs $1,000.00 and has only the freshest fish on it" he says. Okay as my lovely friend Simone, weaves in and out of the intricate intimate tables inside the elegant stone cave and leads me to the lightly lit garden outside, he tells the waiters to give me wine and pasta anything that is special! he says. Alright the waiter asks me, "On the pici do you want fish or seafood?" and the English blokes and me start laughing. Um. What is the difference? I ask. "Fish is Red Snapper, Sea Bass, Cernia, and seafood is Prawns, shrimp, clams..." okay lets try the sea bass. YUM! Gino speaks Italian, only that, and keeps saying, Wait for Simone, wait for Gionvanni!" as he smiles and I try to ask him questions. Giovanni says"I am the fish man. I receive my fish every morning for the cases in the window here. We have fish from Sicily and fish from Sardegna and fish from the coast below Rome, Terracina is where most of my fresh fish comes from, 120 kilometers, everyday. Simone loves to talk to the guests and of course you know he loves the movie stars!" Alright and the description would end there, however, after the GREAT FISH I had of SEA BASS and Pici, yum yum lovely, and the nice white wine, I went to find Simone from the Garden to the Stone Cave and now it is really booming! About 23.15pm. 17 waiters and team, including the chefs, are waltzing in and out of a light elegant chatter, dimly lit atmosphere of mazes inside the cave, and the CAPOS! Now I understand Giovannis statement! It is a bundle of energy. At the entry desk is about 6 waiters all talkking emphatically in Italian, like a scene with Sonny out of the Godfather. You can not get a word in edgewise, trust me! And Giovanni is on the phone, dealing with the team, saying Goodnight to the Guests, Simone is kissing the friends, kissing the friends bambinos, everybody is hugging and kissing as they leave, and the entry hall is meant for maybe 4 people and has 12 in it at all times! The food is highest standard, the atmosphere priceless. As I am wandering the cobblestoned alleys of Roma near the busy Piazza Navona, I stumble upon a little side street that is totally autentically local Rome, very charming and busy with deliveries. 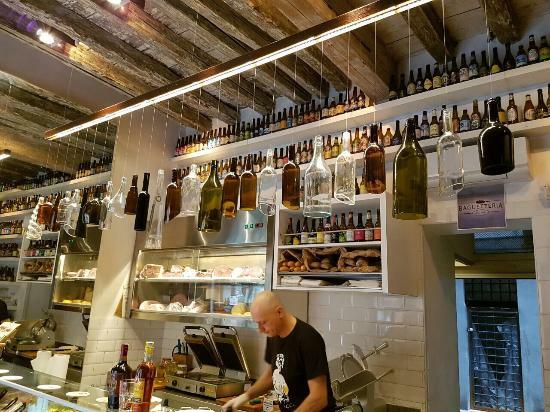 A tiny boutique bistro has it's door open and a couple is engaged in a lively conversation at the glass case displaying a variety of Italian cheeses and meats...as I approach to say Hi I notice about "150" bottles of beer on the wall. "O hi, I am Madeleine from England, " is the first surprise when I try my very bad Italian skills at the beautiful language, "you can speak English if you want and I can translate to Marco. He owns the Bistro," she graciously says and I am happy to have her help me. Thus starts a 1-1/2 hr. conversation of how Marco came to be the Capo (italian for Boss) of the Baguetteria del Fico tucked quietly hidden near the famous Piazzo yet "crazily busy at lunch and dinner hours. The people line up for the great authentic sandwiches and a bottle of craft beer and good luck trying to get a quick lunch here. It isn't happening. You have to learn to wait for that special sandwich that Marco makes for each and every guest." says Madeleine who says she "lives just around the corner here and come here everyday. Since I am gluten free I usually ask Marco to make me a salad yet I eat the sandwiches a couple of times a week they are that good." "Here is the three types, " says Marco as he holds up the special bread, the whole grain bread and the long Italian bread. 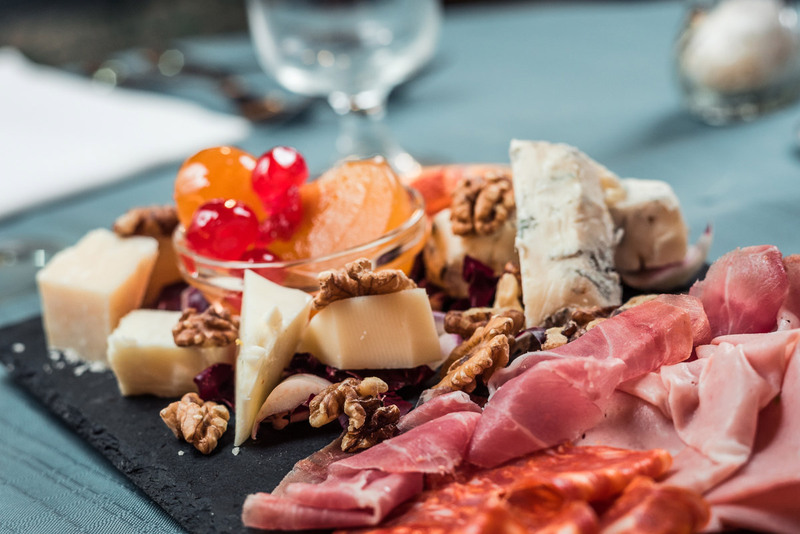 Each one is available for the sandwiches which range from Wild Boar Meat, to Deer to Salmon to Cheese and Meat Platters that the Americans love. 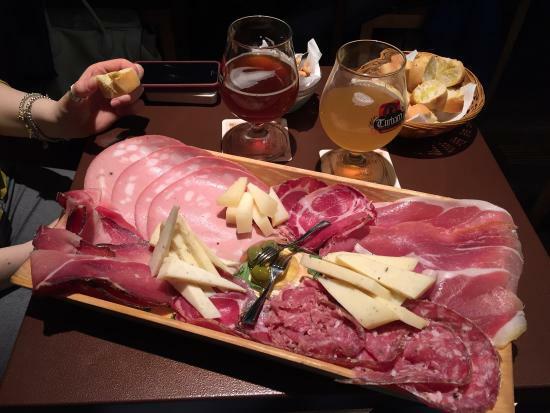 "Yes the Americans are always most excited about sharing the platters and they sit and have to know what each meat is and which region from Italy it comes from and they love to sit and sip a beer and choose from the platters. The Japanese always order sandwiches yet mostly the fish selections and the Chinese the bruschetti." And most importantly Marcos says is, "Fresh and tasty healthy products for lovers of good flavors and beers of choice and always many novelties to intrigue and satisfy every request of our customers immediately!" "O you are giving him a big ego and I am trying to tame it down, " laughs Madeleine and I say that he needs a big ego to show all the International people how special his is. (Plus as Madeleine says he is totally GORGEOUS!) "All fresh everyday and we don't cook any food. You can choose from Italy and Spain the meats and cheeses and the beers, which we have now about 150 Craft Beers, you can choose as many as you want. They come from Italy and Germany and Belgium, you name it. Usually I pick a beer based on the breweries that we work with and they will suggest another brewery to try and we invite or visit or they come here. The special thing to say about the farmers, though, is that we know each and everyone of the people that we buy the products from and we visit many on the farms. It is a fun way of life and we chose it to know people and to learn, not to there you go now by!" he says. "It is the Ambiance of the place, it is real fun to come here, you line up and order that special present custom-made for you and you wait for it the way you do a present. That is what makes it special to come here. And the people. Marco?s partner is Vladimiro and his wife is Catia, who makes the cake everyday. People either chose the cake or a beer when they come in." she says laughing. He says to say he "puts his Heart into his life" and that is true. Yes these are really that big! 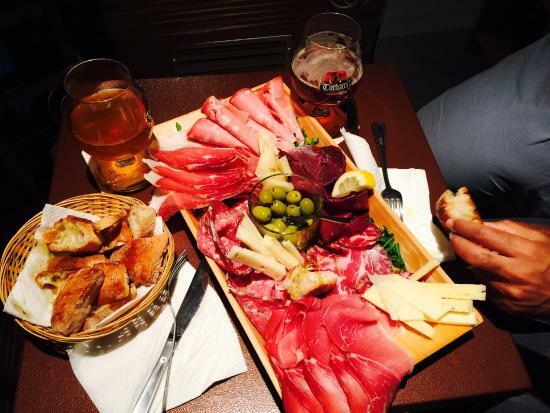 "It is a real treat to come here, such as trendy street platters with fish meats and cheeses that have amazing quality and taste and since I know the beer they people ask me which beer goes with the food choice. I help them to select with the beer or the spritz or the wine. Madeliene loves the spritz and the red wine." says Marco. "Yes yet his spritz is VERY strong!" she warns me. "I just make it that way for her," he jokes and while we are joking he says that is life, it is fun. He has fun with his role and sometimes dances with his guests! "You must come to dinner here!" he says and I say yes of course. He gives me a beer to try and although my choice is a pink beer it is very strong...the fruity rose petals one is pretty good though! FONCLEA MUSIC CLUB FREE ENTRY WITH EMMEANESBOOK LIVE MUSIC EVERYNIGHT 41 YEARS. "It is, of course, about the music, since we are the music club. However, the international eclectic kitchen has been a hit since 41 years and you can find such things to eat as fish and chips or Tbone steak from America.Everybody who comes loves to hear and dance to live music and we love to offer reasonable drinks with great food to enjoy the lovely night out." says Marco, who admits that after 41 years it is a little tiring to own a famous pub. I have known Marco about 3 years now and he told me the story of the famous Music §Club named Fonclea,which used to be the sponsor of the outdoor music festival at Rome every year for 40 years. It started as the first Italian Cultural Music Club in Italy at the Spanish Steps and now it has had its home here 40 years. Please come tonight and the next 3 days to celebrate the 41st anniversary of Fonclea. Tonight on 26th, of September, is the BEAGLES, kind of lovely to remember the Beatles yet different. Every night they have live bands since 41 years. Do the right thing to respect and come at 20.00pm. At Via Crescenzio 82/A. The rooms are downstairs and in comfortable open spaces where you eat dinner and do drinks to thelive music of very eclectic bands, Blues, Fòlk, Bluegrass, Modern, Electric, JAZZ, Country, Pop, HipHop, you name it and they play it! The best is the open conversation and the easy atmosphere at very cheap prices to eat great recipes from everywhere in the world while listening to the up and coming bands from every region of the world too. The drinks are great, too. I am coming tonight to see the Beagles and hope you come to have a ear to hear too!